Would a bishop get removed from his diocese for imposing this. A young priest, no not an oxymoron, or should I write, a young traditional priest, no not an oxymoron either, tried to impose, wait for this, bells and smells, cassocks and surplices and Latin Chant on his liturgically progressive parish. It caused such divisions that his temporary administrator bishop removed him from the parish. I suspect that the parish is malformed. Why else would these things create such division that it leads to a priest being removed from the parish. Maybe the priest was a dictator in these things and too inflexible about some of the things he should have kept. I don't know. Maybe someone else does. But the problem is more than the traditional priest. It is the parish who thinks that bells and smells, cassocks and surplices and Latin Chant are inconsistent with the post-Vatican II Church. If this were the early 1970’s and a long-haired hippie type priest who protests at the draft board and nuclear arms facilities to the point of damaging property and removed altar railings, introduced liturgical dance, ad libbed the words of the Mass, moved the tabernacle to a closet, used French bread and its crumbs for Holy Communion littering the floor with these crumbs, and forced people to stand for the Mass, no kneeling allowed whatsoever and he received Holy Communion last, from a Eucharistic Minister, while he sat during the distribution, he would not have any thing said to him and those who might complain would be labeled soooooo pre-Vatican II. 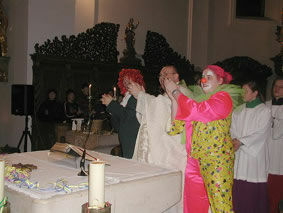 But when a traditional priest imposes some liturgical elements in a progressive parish, he gets removed from the parish. In the 70’s if he molested boys (which is not what happened with this priest) he’d be transferred to another parish. progressive liturgists have consistently done since the 60’s making one think that this kind of pontificating is infallible and that the liturgist has an inside track on the truth (Gnosticism). You can read his whole article HERE at Praytell. It has some merit but offers no mea culpas for what liberalism has done to the Church and liturgy leading to the many tragedies that describe the Catholic Church today and not what the traditionalist priest is guilty of in Saginaw. There are tensions and seeming contradictions between the pastoral shiftof the Second Vatican Council and the seemingly traditionalist tone of its statements on the preservation of chant and the Latin language and the pipe organ and traditional music and the like. This is the tension between my own biases, identified above, that are traditionalist but also admit that the pastoral shift is a real paradigm shift. My question to the pontification of Fr. Ruff, did you just make up out of thin air "Here's the Key????" crap? No surprise. Does anyone by now NOT know that the hierarchy is persecuting Catholics? Suppress the parish and give the bishop the boot. Loonies like this bishop are fighting history. Young priests will continue to be better trained and more traditional than these old failures. It's like putting a finger in the dyke. By coincidence this touches on two things I have looked at recently. Second, I started reading the insiders of the Liturgical Movement (LM). The introductory chapter of Bernard Botte's "From Silence to Participation" says it all here. The LM was a most judgemental bunch of intellectuals who thought everyone should be like them, that the faithful at Mass were losers who needed to participate in the liturgy according to their way of thinking. The liturgy was not a gift from God but mainly a human fabrication that should be changed to become more useful, in this case pastoral, more on the human level for active participation. Fr Ruff is right. There is a basic contradiction in Sacrosanctum Concilium (SC). On the one hand you have tradition such as Latin and chant, while on the other you have active participation by the priesthood of believers. No wonder it was passed so quickly so as not to allow the voting fathers time to realise the gravity of that contradiction. But that is the way an enemy operates, in this case the Modernist LM who successfully got their way of having a fully vernacular liturgy suited for their Enlightenment idea of modern man. Where I depart from Fr Ruff is that SC is a disciplinary document, changeable at any time by the Church, not a divinely inspired one. There was no need to discuss the liturgy at the Council, other than trying to give Modernism an air of a divine mandate. The sad thing about Fr Dwyer, is that he is quite correct. Young people do want tradition. Just listen to the babies at a Sunday morning TLM. I withdraw that...today most TLM churches have a separate place for infants because there are so many of them and parents are often at wits end not being able to stop them from disrupting the beauty of the TLM. I now see a priest can be removed as pastor for following the clear mandate of Sacrosanctum Concilium. When was the last time YOU taught your congregation to chant the parts of the Mass, in Latin, proper to them? How many priests have you removed who routinely violate the rubrics and modify the texts of the Missale Romanum? It sounds like Father Dwyer is doing what pastors should be doing: educating his congregation in proper liturgical practice. Unfortunately it appears he ran up against a generation or two of poorly educated and trained Catholics who would not know the Faith or proper liturgy if smacked in the head. Lest you think we a crank, I was involved in musical ministry for over 40 years. My career began when I was pulled out of the altarboys at age 12 to be a cantor. I was a cantor, soloist, and choir member for over 40 years. The reason I finally walked away was because I felt the Ordinary Form liturgies had become increasingly banal, with trite music, and it seemed more focused on us, rather than Our Lord, I also noticed that the congregation was populated largely with older people, practically devoid of any young folks. I view bishops like you as kind of a modern day King Canute trying to hold back the inevitable. I have found that younger priests are better trained in the Faith and the Sacred Liturgy than their elders. I rarely if ever attend the OF any more. A parish near me which is half Hispanic and half Anglo offers an EF each Sunday. The Mass is packed with young families with their children. It is refreshing that we can all worship the Lord together in the Church's language, Latin. You might consider educating yourself and visit websites like the New Liturgical Movement. 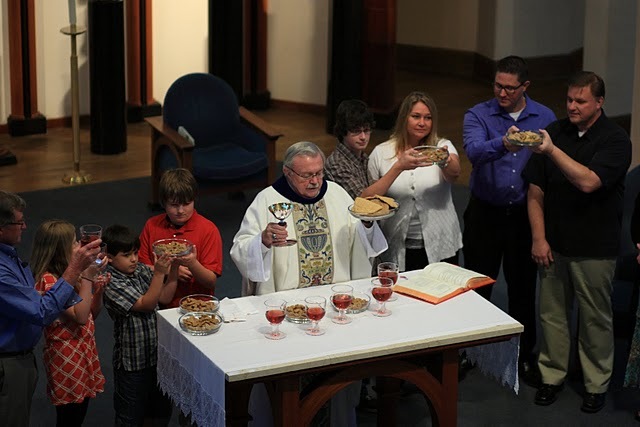 You will see that the fervor and future for the Church is young people who love the Church's liturgical tradition who are walking away in increasing numbers from the dreck they have been served at their territorial parishes. This begs the question: WHY do so many people who fancy themselves as "Vatican II" Catholics have such a visceral, knee-jerk hatred for the Traditional Mass? I could go on, but you get my point. Why is there so much ignorance and hatred toward this Mass? Why is their such hatred for Tradition? You can tell an awful lot about people by observing what they cannot tolerate. Oops! My "their" was supposed to be a "there". Please share the response to your letter (if you get one). Ruff and friends just love to set up strawmen. I don't know any reform of the reform people who want to return to a situation where passive lay people say their own prayers while the clergy celebrate the liturgy. That's certainly not what Ratzinger wanted. Is there any evidence that this is what the Saginaw priest was aiming at? "Suppress the parish and give the bishop the boot." In my experience there is no one more intolerant than a liberal. With regard to the poolside picture, is the problem the shirtless people or the fact it is being conducted by a pool? Certainly Masses are conducted outdoors, at camps and parish events. St. Marys on the Hill in Augusta had one at Clarks Hill 2 years ago for its 100th anniversary, and I'm sure there were people there in bathing suits, shorts and the like. You know that I did not include that in my letter to the bishop. So should I assume you are bored this afternoon because you already brought in your quota of converts and vocations? TJM - Um, Your post indicates that you included it in your letter. No, it doesn't "indicate" that, it plainly states it. After "Your Excellency," and before "Very Truly Yours," you say, "Lest you think we a crank, I was involved in musical ministry for over 40 years...."
Now, mebbe nobody teached it to me rite, but whut comes 'tween the "Salutation" and the "Complimentary Close" is the BODY OF THE LETTER. On second thought, I was taught properly. It seems you were not. You still haven't told me how many converts or vocations you bagged today!! I think someone who devoted over 40 years of musical service to a Rite which is seriously deficient, is a pretty generous person. How many years have you devoted to the EF? And it doesn't count to include the years before 1964! It's the whole package. Poor decision-making from the beginning. Second, have the Mass in a better spot, with some effort. A dinner tray? Really? They couldn't find any other table to use? The priest could have made better effort to create a dignified altar. Third -- why aren't the boys dressed? Do they lack clothing? Is this in a country where this is normal dress? I rather doubt that. Surely the boys are going to dress at some point? 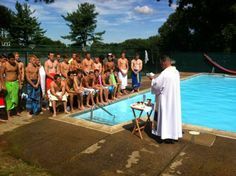 Why not have Mass (a) before they got into bathing suits, or (b) after they change back into street clothes. The reason this matters is because, first, the Mass itself deserves to be treated with respect, and second, those boys deserve to have their Faith treated with respect. This is destructive of the boys' faith. What justifies it? Anonymous, Um TJM was referring to "Suppress the parish and give the bishop the boot." But you know that, and just want to feel superior. Thanks, you are quite correct. But you know who Anonymous is, a rather sad creature who reverts to "anonymous" status when he wants to take a cheap shot. Sadly, he has never responded to my question about the number of converts and vocations he has won for Christ, nor whether he has exhibited a generosity of spirit towards the inveterate Rite of our Church,the EF. Even though I prefer the EF, I gave over 40 years service to the OF, but I suspect he has not given a nano second to the EF, other than as an infant. It is getting to be a toss up between you and Father McDonald. You both show such good sense and evidence such a deep love of the Faith and our Liturgy. In stark contrast, Anonymous is a person who has little regard for the Church and its sacred traditions, appears to be puerile, and is here to score cheap points and get his jollies. Fortunately for the Faithful his kind are rapidly fading from the scene. Please know I pray for you and Father McDonald that you persevere in the good you are doing for the Faithful and our Church. Everything Father Dwyer did are perfectly valid options in the Novus Ordo. The authority of a bishop to regulate the liturgy should not extend to prohibiting valid, even if (horrors) more traditional options. It wasn't about the "traditional" elements in the liturgy. It was about the priest's unacceptable imperious style. Imperious? Engaging in projection much?